Consider Salesforce: you have the Sales Cloud, the Service Cloud, the Marketing Cloud and now the Analytics Cloud 'Wave'. Then there is an Unlimited Edition, the Enterprise Edition, the Developer Edition and the Performance Edition. For mobility, there's Salesforce1. Additionally, you have Community Cloud, Desk.com, Chatter and Data.com! And they are not the only culprits! SAP has different offerings for its cloud and on-premise CRM, and just to add to the confusion conundrum, offers different modules for Sales, Marketing Analytics, Service, Interaction Center, Web Channel, Hybris, to name a few! If you were looking to implement a CRM solution, I would bet my quarterly bonus that you would be half inclined to continue with your 'good-old' excel-based system! Jokes apart, there's no 'one-shoe-fits-all' formula here. 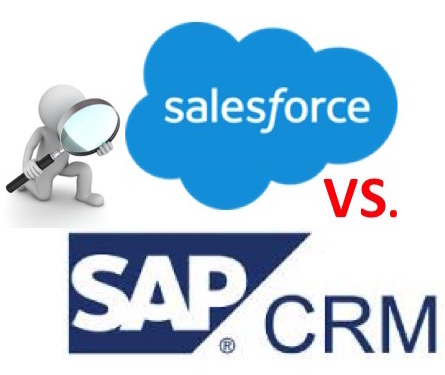 This post still brings forth some key considerations whilst choosing your CRM system and how two leading CRM providers, Salesforce.com and SAP CRM, hold up against those considerations.For the purpose of this comparison, we will consider the features and functionality of the on-premise version of SAP CRM. Comparing SAP CRM and Salesforce is much like an 'apple vs. banana' comparison, as they cater to vastly different user segments with different needs from their CRM system. While some experts recommend SAP CRM if your other front and back-end systems are SAP or SAP-enabled, Salesforce provides you endless features and extremely easy UI. As a business, you need to sit down and prioritize what you need and how badly do you need it, and more often than not, your decision will be based on this exercise. Having said that, it's a glaring reality that no IT system succeeds without being adopted by the end-users. Some reports have claimed that quite a few SAP subsidiaries and units do not use SAP CRM as their own CRM system. If that were true, there could only be one winner of this race!